I remember back in 2010 when I was still working in an office, my colleagues always invites me to join fun runs, and I always refuse and tell myself that I can’t do it because I get tired easily. So when I registered for this event, I am not really sure if I can finish a half marathon or how it feels like to run a 21km distance. 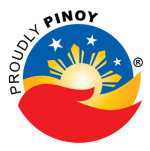 When I run at Marikina Sports Center, I only finish a maximum of 10km totally wasted and tired. So as I count the days till the big event, I really feel like I need more time to practice and train so I can finish my first ever half marathon. The event was very fun and according to the comments that I’ve read online, it is one of the best race event in the Philippines! For first timers like me, I think the organizers did a job well done! As for my comments about the event, here it goes: The singlet looks good. Design and the fit is perfect. I love the route! Although some motorists around Makati area were not very patient considering that they already saw that there’s a race going on. When we reached Roxas Boulevard, I noticed one hydration station already packing up and there’s no more water for the runners. Bananas and Powerade drinks are overflowing on some water stations. I like the finisher’s kit. I’m glad I don’t need to line up for the loyalty shirt. I saw the line for the loyalty shirt and it was so damn long! lol! I felt bad for those runners who need to line up for hours just so they can get their loyalty shirt. I hope next time, they can improve the process of the post-race events so that runners can enjoy other activities. 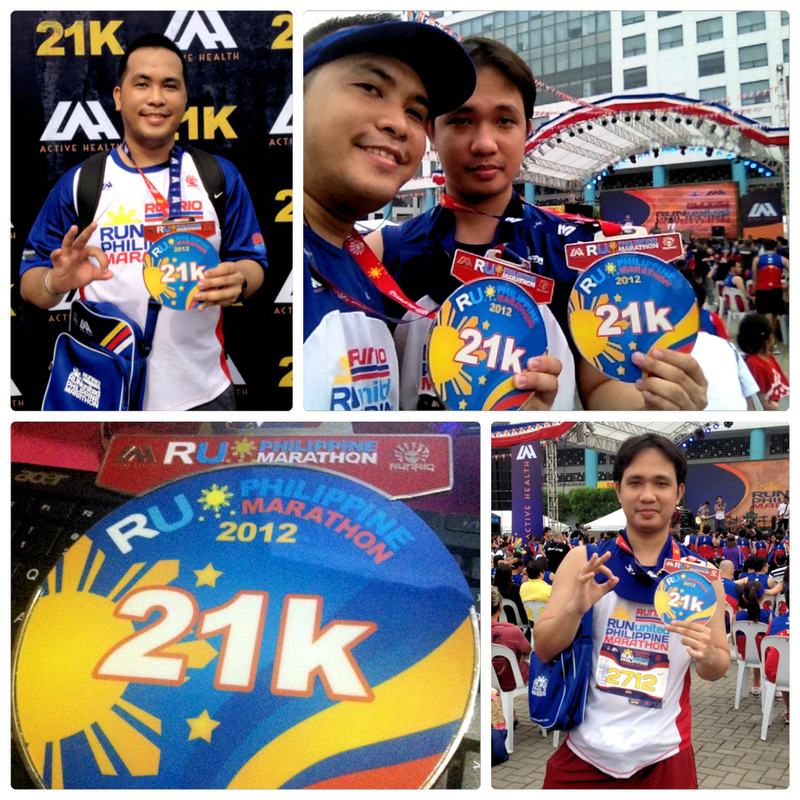 Anyway, the race was really a great challenge for me because this is my first ever race event that I joined. The last few kilometers are very challenging. Some runners are already walking their way to the finish line. I motivated my brother to keep running until the finish line, and the adrenaline kicked in when I saw the “FINISH” sign! 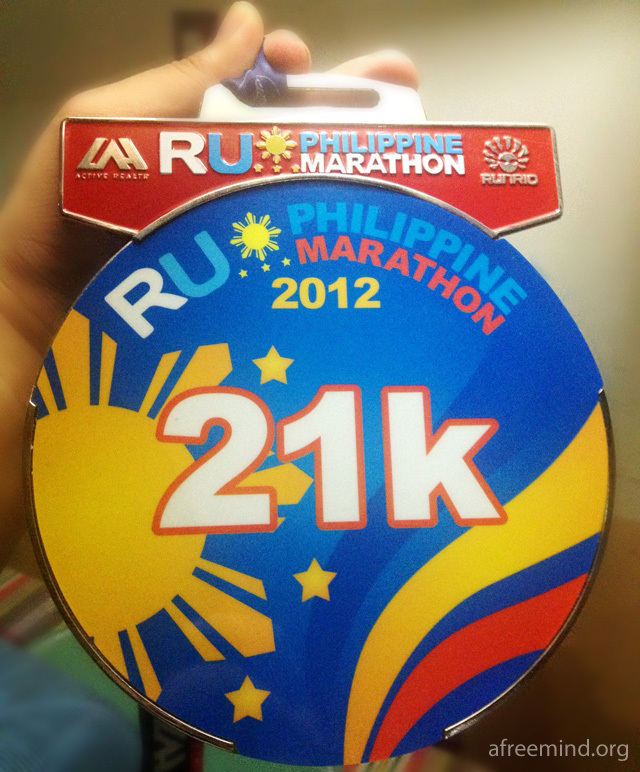 The RUPM 21K Medal! Woohooo! 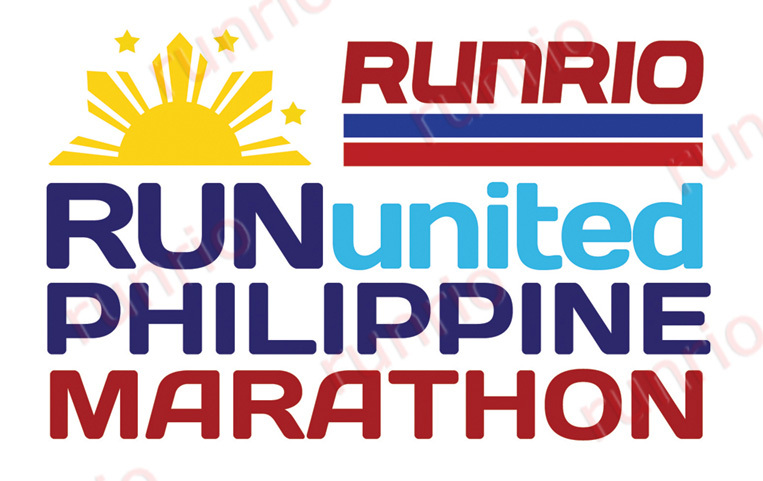 One Response to "Run United Philippine Marathon 2012 Experience"